Virtual-reality developers showed off their wares Wednesday at a trade show in Bellevue, and it looks like their work is moving beyond the games and entertainment arena. The popular image of virtual reality may be the geeky scene of video-gamers in bulky headsets darting at objects only they can see. But a cluster of Seattle-area companies, from four-person startups to Microsoft, is betting the industry will become more than another entertainment hub. Many of them, as well as several hundred VR developers, would-be entrepreneurs, and curious tech workers filed through Meydenbauer Center in Bellevue on Wednesday for the second edition of the SEA VR expo, a trade show highlighting the state of the technology in the area. On display were virtual-reality headsets, which project an immersive world around the wearer. The devices are touted as the next leap in human interaction with computers. Immersive headsets have been in various stages of development — and hype — for decades, but the first in a new generation of high-end hardware is expected to hit the market next year. 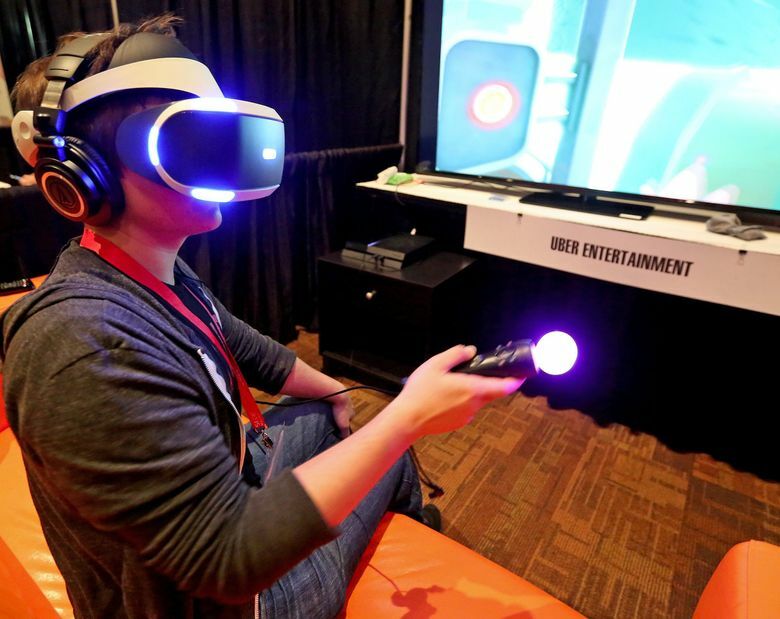 Headset developers include the likes of Sony and Microsoft; a partnership of Bellevue’s Valve and HTC; and Facebook’s Oculus, which has much of its engineering team in Seattle. Their most natural first application, observers say, is in gaming and entertainment. Personal-computer and console gamers tend to be early adopters of technology. They’re also accustomed to shelling out hundreds of dollars at a time for hardware. Berry is banking on it. The chief executive of Kirkland game studio Uber Entertainment, Berry last year started mining a different space: software that adapts Web browsers, word processors and other desktop software to a virtual-reality environment. He also saw an opening to tout Seattle’s place in the industry, and helped set up the SEA VR show. Foundry 10, a research organization that receives funding from Valve co-founder Gabe Newell, is examining how virtual reality and other technologies with roots in gaming can help in education.. Rocket Alien, a Seattle studio, built a simulator to train workers at nuclear-power plants. Pluto VR, whose founders include the co-founder of Seattle gaming giant PopCap Games, is working on collaboration tools for virtual reality. Madrona on Wednesday announced its first investment in a virtual-reality software developer, leading a $4 million funding round for Berry’s Envelop VR. Though occasional motion sickness remains an issue, the technology is starting to catch up with developers’ aspirations. Epic, a North Carolina game studio, does much of the work on Unreal, its game-focused software-development engine, in Bellevue. It has tailored Unreal for VR headsets, a bid to take some of the legwork out of programming for the devices. Information in this article, originally published Oct. 28, 2015, was corrected Oct. 30, 2015. A previous version of this story incorrectly stated that Foundry 10, a research organization, was a nonprofit and that it received funding from Valve. In fact, it is organized as a limited liability company and received funding from Valve co-founder Gabe Newell..